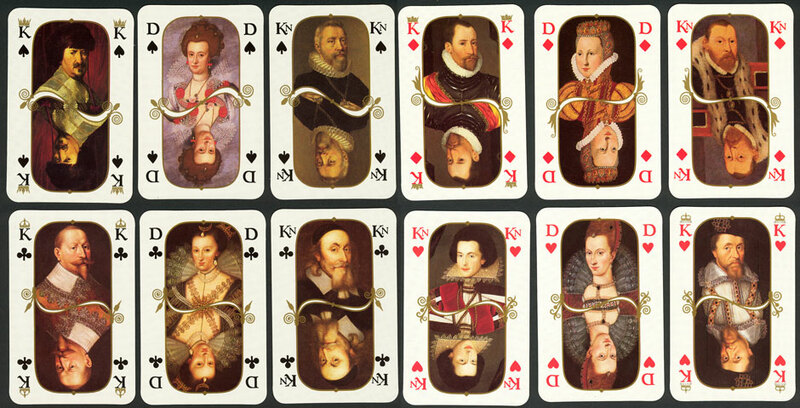 The anniversary of Christian IV in 1988 was a great event in Denmark with exhibitions in museums for which this special pack of playing cards was published. Christian IV himself is the K♠ and his wife Anne Katherine of Brandenburg is the Q♠. The other suits feature contemporary royalty from other countries whilst the Jokers are Corfitz Ulfeld and Leonora Christine, two figures from Danish history. 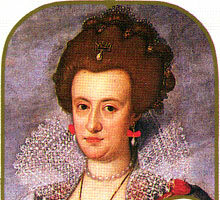 The portraits were adapted mainly from paintings in Danish museums, except ♥ King James VI of Scotland (1566-1625) and ♥ Queen Anna of Denmark which were from paintings in the British embassy of Denmark. The designer was Thora Fisker. 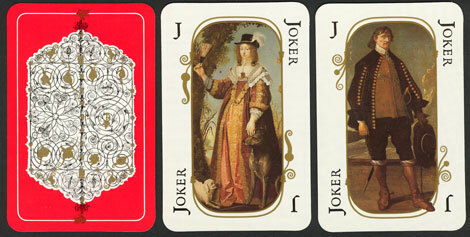 Above: King Christian IV anniversary pack, designed by Thora Fisker and printed by L. Jevison Junior and sold in a double plastic box with matching red or yellow back colour. The back pattern is a latticework from 1617 which can be seen in the church in the castle of Frederiksborg.